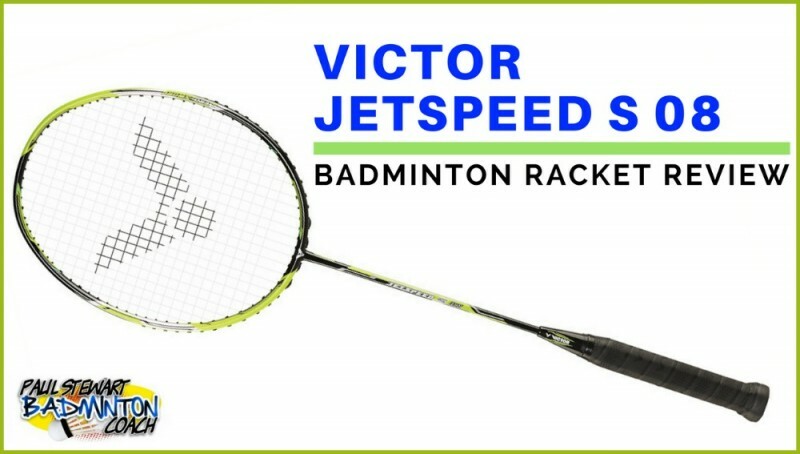 Victor Jetspeed S 08 badminton racket was added to the European catalogue in April 2017. It has a tough job fighting off the huge competition in the Jetspeed and Victor range. The Victor Jetspeed series has become extremely popular with players around the world. You may recall that the Jetspeed range was supposed to replace the highly successful Bravesword range from Victor. The most popular rackets in the range are the Jetspeed 10 and Jetspeed 12 which have sold out numerous times in Europe. They are both incredibly popular with international players. I wonder whether the JS08 will find its own niche and be accepted into the Jetspeed family? Jetspeed 08 arrived with the now familiar full length racket cover with the Jetspeed logo in blue. JS08 is a bright racket with a mix of blue and yellow, a successful combination. This is a 5U version (75-79g) G5, small grip. This is a very light racket with medium flex. To be honest, I’m not a fan of the super-light rackets. I respect they have a place in this wonderful sport, however, they’re just not for me. I prefer more meat in the racket and tend to find the super-light rackets feel quite flimsy in comparison. However, putting aside my preferences, I expect this racket will be fast, but will it have enough weight in the head to retain my interest? I got a surprise when I first hit with JS08. Instead of a super-light head that needed more work to hit a decent clear, I found this racket had some decent weight in the head. This, combined with the overall lighter frame allowed my hands to work really fast. I got really good results without having to over exert myself. Drop shots felt good allowing me to play a good mix of shots, enjoying the feel of the head in the shot but with the added benefit of moving the racket that little bit faster. It was nice to play a few more wristy shots. Throwing the racket that bit quicker for some of the slices was a delight. Onto the smash. My hands generated more racket head speed providing decent power here. The medium flex can be felt without me wanting to stiffen the frame, it felt just right. This combination works so well and I enjoyed experimenting with stick smashes, a shot I don’t play too often with my current batch of rackets. Flat drives and pushes were so easy and took very little effort. The 5U weight means that the racket is so light you can stand on court all day playing these rallies without fatiguing. There is sufficient punch through the head to provide speed without losing the head. This racket seems to be made for mid court rallies. I enjoyed defending with JS08. The head moves so well but this doesn’t mean you can let your guard down and get sloppy with your technique. Fast hands will save you time and again with this kind of maneuverability but it gets even better when applying good technique. The beauty of the lighter frame is the ability to whip the shuttle quickly and change direction at will. Again, good technique is rewarded here although it is easy to lower the racket and get a little lazy. You need good control as you can almost be too quick to latch on to some net kill opportunities. Over-excitement with a super-light racket can be your downfall, so you will need to pay attention to this and retain good control. My initial reservations about the Victor Jetspeed S 08 were blown away with its performance. Of course, for most of us, it won’t hit as hard as other rackets. However, if you are one of the gifted genetically powerful players, then this racket can be lethal in your hands. It will also suit those players needing to speed up their swing to achieve more power. Good use of the hands will provide the rewards you are looking for. The racket is fast, and the weight in the head is a welcome combination that works so well. It is punchy but as you would expect, lacks that total beef. It’s not built that way by design. RRP is £160 and I expect, with discount, you will pay closer to £120. For me, this is Victor’s secret weapon of the season and has become by favourite feeding racket, especially when I have more time on court. It stays in my bag so that I can use it as and when required, however I am enjoying this super-light racket whenever it is selected for action. As such, I rate Victor Jetspeed S 08 badminton racket 4.5 stars.